I was hoping to find a little speed and I guess I found it. I met Frank and Karla in Cary to ride with them the rest of the way to Asheboro early Saturday morning. The trip passed quickly and we had no problem finding parking at the race site, Memorial Park. Despite having over double the normal number of entrants, packet pick-up went quickly. Karla and I then went for a warm-up mile about 30 minutes before the race start. We were going to be really lucky with great weather for the race with the thermometer around the mid-50's and mostly overcast. It looked like they were going to have a timely start so after a few strides we lined up near the front. With 390 entrants, it didn't look like there were too many fast runners so we lined up near the front. Mark Long from the Mangum Track Club was there, the only other person we knew in the race. Mark is now in my age-group so it looked like he may be my main competition. The course was a little hillier than I remembered but nothing too steep or really long but there was a little rise at the start. I began easily , not getting caught up in the excitement. There were a bunch of young guys in front of me but I figured they would burn out quickly and most of them did. They had the half-mile of this certified course marked and I went through it in 3:29, right where I wanted to be. Mark passed me then and I just let him go and stuck with my planned pace. If he was feeling better than me then he could have 1st place. I wasn't going to blow up early trying to race him. As we headed down a nice hill, I was steadily passing people that had gone out too fast. Mark had moved about 20 yards ahead but as we neared the mile mark I was closing the gap. I passed the mile in 6:54 and felt great, feeling confident I could achieve my sub 22 goal unless there were some really tough hills ahead. The course made a little climb to the halfway point where they had a water stop, totally unnecessary in a cool 5k and it was here I eased by Mark. I know he has had some injury issues lately so was not in top shape. We had a nice downhill again now and I finally passed the last of the kids that had started out so quickly. At about 1.75 we hit probably the steepest hill but it isn't very long so I just eased off the effort slightly. However, this is the beginning of a gradual rise for about the next 3/4 mile. The course flattens a little then climbs a little more. Even with the nice downhill portions, I still slowed down the 2nd mile to 7:06, or 13:58 for 2 miles. And of course like all 5 K's the last mile starts to hurt if you are racing and giving it all you have. The good thing is that the pain only last a little while. I was looking forward to getting through Downtown Asheboro knowing I had a sweet 1/4 mile downhill finish ahead. As usual I probably sounded like I was dying to anyone nearby but I was still passing a few people. I went by the 3 mile mark in 21:14, (7:16 for mile 3) so I knew I had the sub -22 in the bag as I passed a young 20-something guy. As we neared the line I could hear him trying to come back on me so I kicked it up a notch but then just before the finish he found an extra gear that doesn't exist anymore in the legs and he nipped me at the line. Sprinting is not what I had wanted to do and I paid for it with a minute of dry-heaving inn the chute but I got what I came for. Then it was time to wait for Karla. Mark had come in about 30 seconds behind me but no Karla in sight. I finally spotted her but there would be no PR for her today. She crossed the line in 24:23, which is still a great time for her on this course. I'm pretty sure she could have done it on a flat course. I told her I was pretty sure she won her- age-group because I hadn't seen many women finish and none looked 50 but then neither does she. We waited for Frank to come in which he did in a very good time for him , especially considering how little training he has been doing and then made our way over to the park for refreshments. Karla and I went for a 2 mile cool-down and then waited for the results and awards. As I thought, she not only won her age-group but was 1st place Masters female. I won the 50-54 age-group and Mark was 2nd. And Frank was 3rd in his. Even with 390 finishers I was amazed to come in 21st place overall. 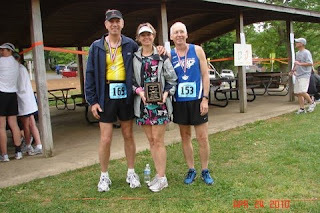 This is a very nice race and the local running club, the Randolph County Roadrunners does a great job. Here is a link to the club and race website where you can check out the results. One really cool thing is that my time of 21:54 was exactly 1 minute faster than I ran here in 2002, the last time I was here. Congratulations to all of you! That's very impressive.